Angiogenesis is a normal process for healing and reproduction. It involves the growth of new capillary blood vessels from the pre-existing vessels. However, in disease states angiogenesis leads to abnormal blood vessel growth. This then becomes the underlying process for many deadly diseases, including cancers and retinopathy. Pharmaceutical R&D is currently focused on devising strategies to target biochemical and cellular events involved in the angiogenesis in search of treatment of various diseases. An important approach has been to inhibit the action of various enzymes and factors involved in the complex cascade of reactions leading to new blood vessel formation. 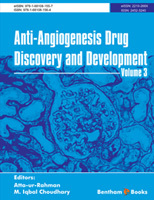 The 3rd volume of the book series “Anti-Angiogenesis Drug Discovery and Development” is a compilation of five excellent reviews, written by leading researchers in these fields. Each review is focused on a certain important aspect of angiogenesis and the modulation of the angiogenesis process through chemotherapeutic agents as possible treatments of various diseases. Makhouli et al. have contributed a review on various clinical and pre-clinical trials on beta-blockers, such as catecholamine, for the treatment of retinopathy of prematurity (ROP). ROP is a disease of premature babies, which involves abnormal blood vessel formation in the retina. This growth can cause the retina to detach from the back of the eye, leading to complete blindness. The diseases range from being mild to severe and currently no treatment is available. The authors have summarized the results of various clinical and preclinical studies of oral propranolol treatment, and evaluated the efficacy and safety of such treatment at various stages of ROP. Propranolol is used in the treatment of tremors hypertension (high blood pressure), heart rhythm disorders, angina (chest pain), and in other heart or circulatory disorders. It is also used to prevent heart attack, and reduce the severity and frequency of migraine headaches. The use of propranolol in ROP is an important step forward, as well as an example of drug repurposing. Integrins represent a family of adhesion receptor proteins involved in angiogenesis. The review contributed by Lazarovici et al. is focused on the development of antagonists (disintegrins) of various types of integrins for therapeutic purposes. Obtustatin and viperistatin, two members of the disintegrin protein family, have been used as templates for the synthesis of two linear and cyclic peptides, containing the KTS binding motif. More specifically, two synthetic cyclic linear peptides, vimocin and vidapin, have attracted major scientific interests as dual antagonists of α1/α2 integrins. In vitro and in vivo studies indicated their high potency in inhibiting the adhesion of integrins, thus slowing down the angiogenesis induced by vascular endothelial growth factors. The results of various studies, including stability, potency, efficacy, computational modeling, etc. indicate the promising nature of vimocin and vidapin. The last three reviews are focused on the therapeutic potential of various antiangiogenic drug candidates in the treatment of cancers, such as lung cancer, hepatocellular carcinoma, and glioblastoma. All three reviews start with the detail descriptions of the role of angiogenesis in tumor progression, and molecular events in angiogenic process, followed by the development of various anti-angiogenic compounds to inhibit the angiogenesis cascade as potential drugs. The results of animal studies and clinical trials present a mixed picture, which demands further studies in this field. Ellis and Al Farsi review the current status of antiangiogenic therapy in the treatment of lung cancer, known for very high level of angiogenic activity, aggressive nature, and very low survival rate. Antiangiogenic drugs can offer a better therapeutic option for lung cancer, and thus vigorous research is being conducted on this class of potential drugs. The authors have exhaustively reviewed the results of clinical studies on various combinations of therapeutic agents i.e. antiangiogenic monoclonal antibody bevacizumab and various classes of anti-cancer drugs, on the improvement of survival, disease progression, tumor recurrence, and metastasis in NSCLC (Non-small cell lung cancer) patients. The results of these studies were found to be non-conclusive, though some improvement in survival rate has been noted. The authors present a strong case in favor of further studies in the identification of biomarkers, as well as additional translational research. Hepatocellular carcinoma (HCC) is the most malignant tumor with a very high mortality rate. Available treatment options are few, and far from ideal. HCC is known for the high level of neo-angiogenesis. A series of angiogenic factors have been identified in HCC as possible targets for anti-angiogenic drug discovery. Recently, several anti-agiogenic agents were developed, and extensive animal studies and clinical trials have been conducted. The review, contributed by Sun et al., describes the salient features of various clinical and pre-clinical studies, as well as limitation, challenges, and recent advances in the possible treatment of HCC by anti-angiogenic agents, and their combinations with classical anti-HCC drugs. The last review of this volume, contributed by Martinho et al., focuses on the treatment of glioblastoma multiforme (GBM) by an FDA approved anti-angiogenic monoclonal antibody, bevacizumab. The results of clinical trials on bevacizumab in combination with radiotherapy and the anti-cancer drug temozolomide (TMZ) have shown improved survival rate in GBM patients. However, data about the quality of life, and functional improvements are conflicting. Reports of adverse effects of bevacizumab further complicate the situation. This requires a better understanding of the biology and mechanism of the angiogenic process involved the in progression of GBM, and improved clinical study design. We wish to express our gratitude to all the eminent contributors for the timely submission of their articles which have resulted in this excellent 3rd volume of the eBook series volume in this important field. It is the result of efficient coordination and excellent management of the entire team of Bentham Science Publishers. We would like to appreciate the joint efforts of Mr. Omer Shafi (Assistant Manager Publications), Mr. Shehzad Naqvi (Manager Publications) and team leader Mr. Mahmood Alam (Director Publications). We sincerely hope that this volume will receive wide appreciation from the readers.